I know I just posted a garden update, but so many new little plants are shooting up that I had to go grab a few new photos. 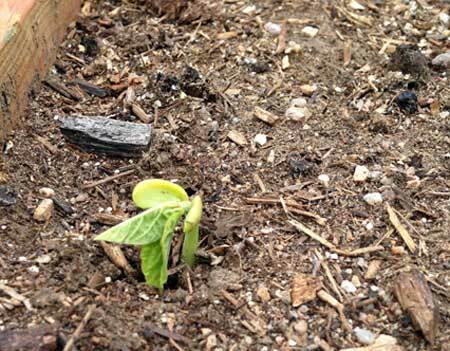 Most of the beans are already popping up: dragon’s tongue, purple hull peas, garbanzos, and the latest arrival this morning, calypso beans. 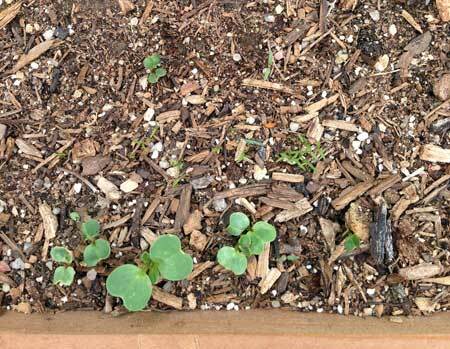 Carrots, leeks and scallions are all finally to appear, some of which were planted way back in mid-April. I always love watching beans come up — remarkable how quickly they grow! These are dragon’s tongue, and I also planted garbanzo, calypso, purple hull peas, and purple string beans. This may be the first year I actually get a decent yield of Tuscan kale. Cherry Belle radishes interplanted with rows of carrots. 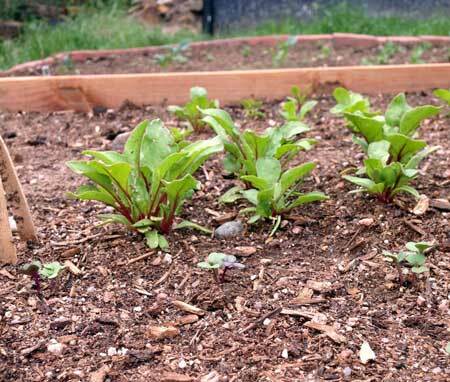 Beets, with kohlrabi sprouts in the foreground and Swiss chard in the rear. 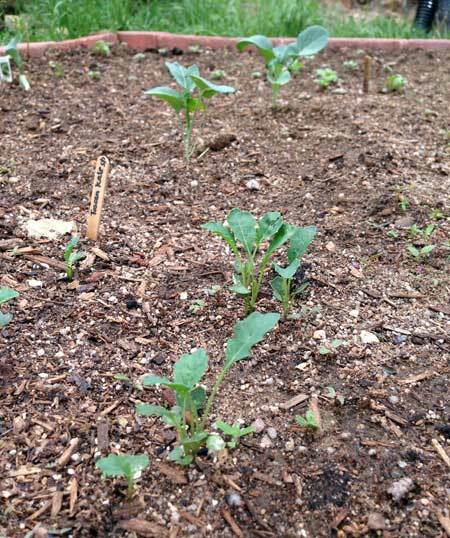 Purple potatoes sprouting, along with what looks to be a bumper crop of weeds. My big project this week was removing mulch and landscaping fabric from two areas around the house in the front yard and getting them planted with seeds and starts that are both decorative and useful in some way: either edible, medicinal or both. It is hard to see in this photo, but the bed on the right now contains sweet woodruff, bloody dock, and French sorrel, as well as some flower seeds. The bed to the left was just planted with flowers like lavender hyssop, calendula, bee balm, poppies, shiso, and dianthus. 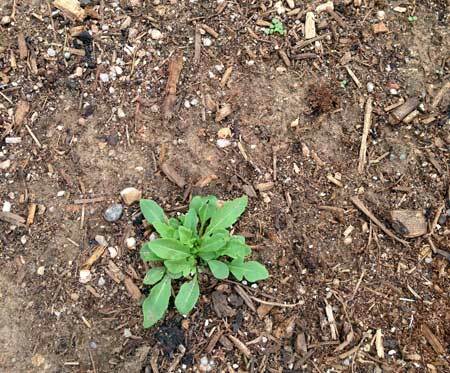 Not much to see here yet—sweet woodruff, bloody dock, and French sorrel plants are in, along with some seeds. 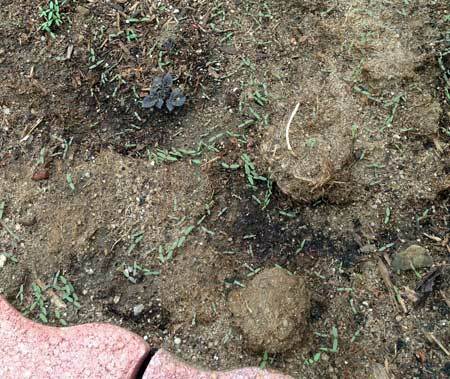 While we were at it, I also planted some creeping/woolly thyme, pennyroyal and Corsican mint in a few choice spots around the front yard, mostly around edges and under the trees, in the hopes that they will spread for groundcover to replace our dead grass with edible, aromatic herbs. 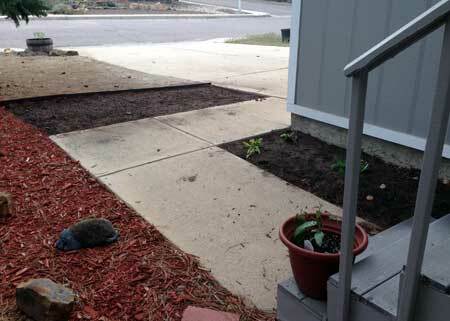 Spaces between beds are now weeded and mulched, although I left the edible lambsquarter around the edges. 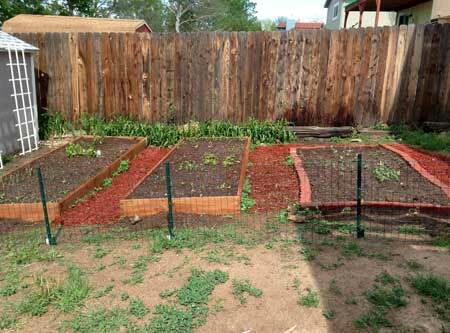 Finally, I’m in the process of weeding around the raised beds, and getting ready to lay down several bags of displaced mulch back there. I may also transport all the dead pine needles from the front and back to the side yard, which is covered with landscaping rock and weeds, in an attempt to suppress the ugliness.